Hello readers! 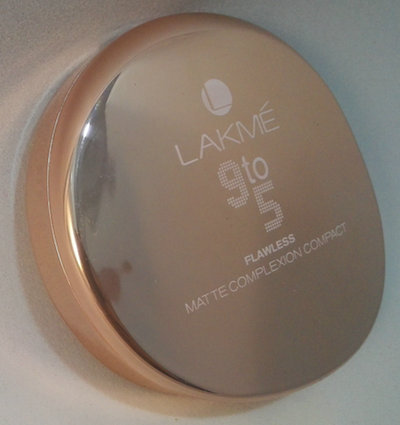 Today I am going to be reviewing one of my all-time favorite affordable powders, the Lakme 9 to 5 Flawless Matte Complexion Compact Powder! 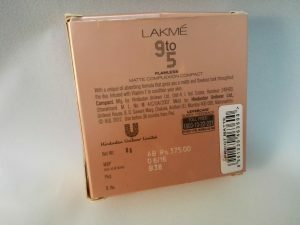 The packaging itself, is kinda expensive looking, with the rose-gold container and all. It comes with a puff. Actually, it barely qualifies as a velour puff. It’s really thin and fragile, and I would prefer it if they made the puff lightly more thicker. 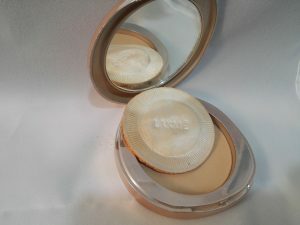 The main reason I love this powder is mainly because it doubles up as foundation too. It’s very buildable so you can just use the puff in it and just apply it on the face. It gives you medium to full coverage, without looking cakey or unnatural. Or, you could just dust this on top of liquid foundation to set it. I did mention this in my Garnier BB Cream review. 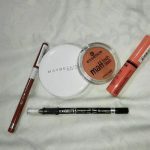 My next favorite thing to do with this product, after using it as powder foundation, is to dust it over the Garnier BB Cream, to tone down the shine, and add some color. If you read my blogs recently, you’ll know that I have combo skin. It mainly gets really greasy on my nose and chin. This powder, manages to keep all that in control for 3 to 4 hours. You’ll have to touch up after that, but that’s not really a problem. 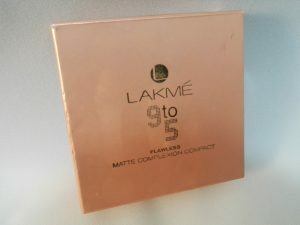 The Lakme 9 to 5 Matte Complexion Compact Powder is also a really good base for any other powder product that you may choose to apply, such as bronzer, blush or highlight. It just makes the products blend really beautifully.I would like to warn you that if you do end up using any, liquid or cream products above this powder, it may end up looking a very badly blended and messy piece of art. So make it a point to apply liquid bronzer, cream highlight and products of that sort BELOW this powder. Final thoughts: Absolutely great powder for people with combo skin and oily skin, I would recommend that people with dry skin stay away from this powder, as it may look cakey on dry skin. Can be doubled up as foundation. May not suit dry skin users.